The Albiceleste are not the most talented or coherent team in Russia and preparations have been chaotic. But they do have Messi, and that means they simply cannot be written off as contenders. Judging by the events of the last fortnight, merely stepping out onto the pitch in Moscow this Saturday will feel like a win for Argentina's embattled World Cup warriors. After a chaotic spell of preparation for the tournament that at times bordered on magical realism, Jorge Sampaoli's men now have to prove they have a rightful claim to be called challengers for the title in perhaps one of the most unpredictable finals in recent memory. Injury, scandal and even a tense stand-off with Israel over a cancelled pre-World Cup friendly have ensured that reams of newsprint have been dedicated to the Albiceleste before a single ball has been kicked in Russia. Argentina have lost two of their assumed starters to fitness problems, goalkeeper Sergio Romero and playmaker Manuel Lanzini, and go into the World Cup with just 90 minutes of action under their belts of late, having downed humble Haiti thanks to an inspirational performance from Lionel Messi at the Bombonera almost three weeks ago. If nothing else Sampaoli's men will certainly have the surprise factor in their favour; almost nobody outside of the squad, least of all first opponents Iceland, will have a definitive idea of how 2014's finalists will line up until the ball starts rolling on Saturday morning. What is certain, however, is that if Argentina are to have any chance of breaking their 32-year drought Messi will be key. The Barcelona forward is his nation's captain and standard-bearer, the centre of almost every passage of play in the opposition half. For too long, Argentina's primary attacking strategy has been hand the ball to Leo and see what happens, a phenomenon perpetuated by the disastrous instability that has seen three coaches and three AFA (Argentine Football Association) presidents come and go since Mario Götze broke Albiceleste hearts in the Maracana four years ago. Messi has been perhaps the only constant during that period, fighting his own personal holding action while everything else seemed to fall apart around him. Will we still see the diminutive wizard decked in national colours once the World Cup is over? 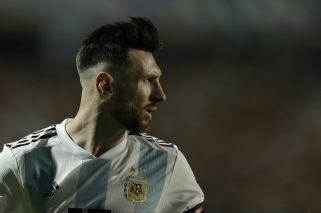 Messi has voiced his discontent with AFA and the Argentina set-up in general on numerous occasions, and the weight of three consecutive final defeats – that extra-time reverse in 2014 and two subsequent penalty shoot-out losses at the hands of Chile in the Copa América – logically weigh heavy on his shoulders. “The fact we have got to three finals without winning and have also gone through tough times with the press and the Argentine people, due to their way of seeing what we have done and not valuing those final appearances, it is not easy,” the Rosario native told Sport during the week. Having already retired from the national team once and changed his mind, in the aftermath of the 2016 Copa América final, it remains to be seen whether Messi is willing to brush himself off and commit to yet another four-year cycle once the dust settles in Russia. The good news for Argentina is that among the general disorder that has characterised this last cycle, there is a hint of optimism for the future. Amongst a core of players that remains unchanged from the last finals – Messi, the injured Romero, the evergreen Javier Mascherano and Lucas Biglia in the middle, winger Ángel Di Maria and forward pair Sergio Agüero and Gonzalo Higuaín – the next generation of talent are starting to make their presence felt. Paris Saint-Germain's Giovani Lo Celso has an excellent chance of pushing himself ahead of either Mascherano or Biglia to claim a place in Sampaoli's projected two-man midfield axis, while both Independiente's Maxi Meza and Cristian Pavón of Boca carry the hopes of their clubs in fighting for a place. And while the 2018 World Cup will see Agüero and Higuaín carrying the torch in the penalty area for the Albiceleste, back home the likes of Mauro Icardi and Lautaro Martínez are champing at the bit for the chance to prove themselves on the highest stage. In the final third at least, the future looks bright for the nation. 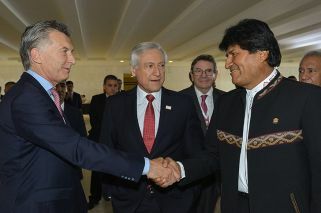 It is at the back where most of Argentina's concerns are concentrated. March's 6-1 blow-out at the hands of Spain demonstrated what most of us were acutely aware of: Sampaoli's defence is not strong enough to withstand an elite force when the pressure is on. Romero's injury additionally opened a further headache, leaving the goalkeeper position wide open. Willy Caballero, who replaced Romero in that aforementioned defeat, is set to start between the posts, despite heavy pressure to call on River Plate hero Franco Armani after years of starring first in Atlético Nacional and now, at present, in the Monumental. In front of the Chelsea shot-stopper is Nicolás Otamendi, Argentina's sole world-class defender and the man charged with steadying a rickety ship that is starved of big-game experience with the national team. Back in 2014 then-coach Alejandro Sabella managed to strike a reasonable balance between his side's enviable firepower and less than formidable defensive unit; if Sampaoli can manage a similar compromise in Russia it would be a huge feat for the man who has already written his name into Chile’s history with the 2015 Copa title. Nonetheless, he goes into the World Cup with his fair share of critics after an underwhelming first 12 months in the Argentina hot seat. It is fair to say that Sampaoli has been unfairly targeted by certain sectors of the local press, and often for reasons beyond his trademark innovative, dynamic football. The coach's track record points to an inveterate winner, who built a brilliant side with Universidad de Chile prior to moving to the national team and also left a positive impression in his action-packed year at Sevilla. Unperturbed by a tortuous end to the marathon World Cup qualifying campaign that needed a strong dose of Messi magic right at the death, he is planning a gutsy approach to the tournament that promises to mark out Argentina as one of the more entertaining sides to watch in Russia. “We are obliged to move an entire nation. I hope we can do it in the way we want,” Sampaoli signalled in Ezeiza back in May, the day he confirmed the 23 players that would travel to Russia in order to bring home the famous Jules Rimet trophy. It is clear that it will not be an easy road. First up await Iceland, the Viking warriors that enraptured the world of football with their displays at 2016's European Championship that included a run to the quarter finals and the elimination of former World Cup winners, England. The nation will not shy away from a meeting with Argentina's stars, and will look to bully and intimidate across the 90 minutes in a baptism of fire for the South American team. After Iceland, the Albiceleste will move on to meet Croatia and Nigeria in their two remaining Group D engagements. Croatia promises to be another tricky fixture, with the midfield axis of Luka Modric and Ivan Rakitic – no strangers to Messi as Real Madrid and Barca stars respectively – outstripping anything Argentina can field in the middle of the pitch. Nigeria, meanwhile, hold the psychological advantage of triumphing 4-2 over Sampaoli's charges in the pair's last meeting, and the Super Eagles' pace and potency out wide threatens to once more give the side problems over the duration of the game. Later, and logically depending on results throughout the group stages, a clash either with highly rated France in the last 16 or Spain in the quarter finals looms large, two games that prior to the tournament one would be reluctant to predict in the Albiceleste's favour. It will be a tough task, then, but not yet impossible. With Brazil, Germany and Spain (despite the latter's AFA-esque meltdown in the last few days in sacking coach Julen Lopetegui on the eve of the tournament) leading most observer's list of favourites, Argentina begin the World Cup as one of the dark horses, expected to reach the last eight and not much further. There is always the potential for surprise, however, especially with a magician like Messi in the ranks. The captain carries his nation's hopes on his shoulders once more, in his third World Cup with his beloved Argentina. Along the way he has silenced all his critics, convinced all the irate taxi drivers of Buenos Aires who opined he felt more Catalan than Argentine with countless match-winning performances decked in blue and white. And in 2018, once more, as his side prepare for the tournament in less than ideal fashion, it is he to whom all heads will turn in the quest for glory. Argentina have not had the best run-in to this World Cup, nor do they have the most talented or coherent team in the competition. But they do have Messi, and that factor means that no matter what happens in Russia they simply cannot be written off as contenders.